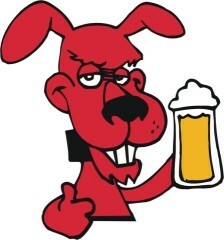 What happens when two dogs walk into a bar? Well, chances are if there entering Rumors, a hotel just a few blocks off the Las Vegas Strip, they're not only going to be welcomed, they're going to have an opportunity to fraternize with other four-legged guests. And to boot, at this hotel's Yappy Hour, they'll even receive some swag, filled with edible doggie treats. This once-a-month bash was conceived by Judi Perez, an executive with the Siegel Group, Rumor's parent company, who likes to have her dog accompany her on social outings. 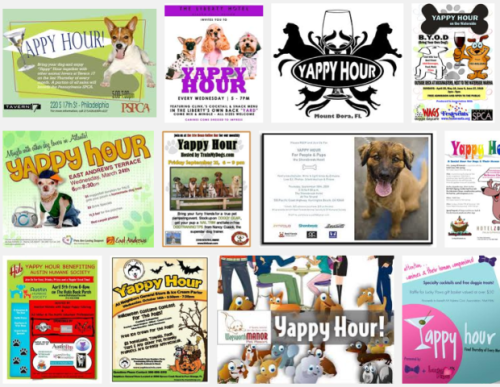 Going into its second year, Rumor's "Yappy Hour" is now attracting on average 175 dog-owners and their pets. Conducted in a large, fenced outdoor courtyard, portable bars are moved in to supply the spirits. Masters & their BFFs at Rumor's "Yappy Hour"
Parties run on the third Thursday of every month from 6-9 p.m. with the next one scheduled for April 18th - just in case- you're traveling through Vegas with man's best friend in tow. The $10 admission includes a drink and that gift bag filled with edible dog treats. A portion of the proceeds go to the Animal Foundation, a Las Vegas animal shelter. But in case, Las Vegas is not on your itinerary when next you travel with your pup -- no worries, with a quick search on Google Images, you'll find dozens of locations around the country that feature Yappy Hours. From bars and hotels in Philadelphia, to Manhattan to Florida, it appears that this type of event has been going on for years. And if you thought that some upscale establishments would snub their noses at conducting a Yappy Hour, think again. In an effort to promote their "Pampered Pooch" program, the Ritz Carlton, Half Moon Bay in California has been "barking" up a storm about their upgraded version of Yappy Hour. “At The Ritz-Carlton, Half Moon Bay, we are dog-passionate. Guests on all fours are very welcome,” noted Jay Heidenreich, Director of Sales & Marketing for the hotel last year. Canine clientele enjoy complimentary treats and flavored waters while their owners sip on specially priced beer and wine from the bar, as well as items from the resort’s Pampered Pooch menu, including “Bow Wow Meatballs and Rice” and “Canine Casserole." 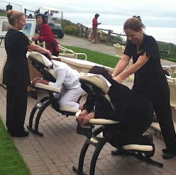 For the “ulti-mutt” in luxury, The Ritz-Carlton Spa, Half Moon Bay offers “Pooch and Parent” 15-minute massages. So, it looks like Yappy Hours at a variety venues are just waiting for you and your four-legged friends to come on down -- while giving a whole new meaning to that "Hair of the Dog!"